Felix Rosenqvist was the top rookie in Sunday’s Acura Grand Prix of Long Beach, round four of the NTT IndyCar Series season, but was nonetheless left lamenting what could have been following a costly qualifying crash. 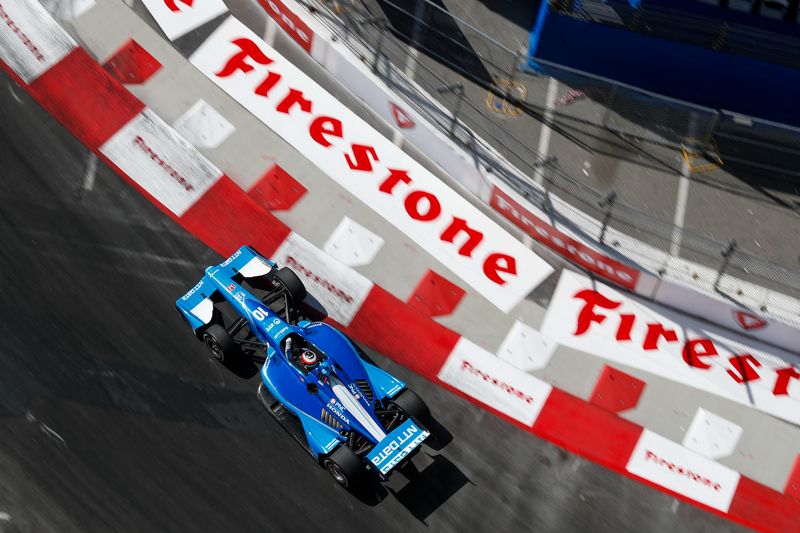 On his first-ever visit to the Long Beach street track, Rosenqvist looked on course to vie for a maiden IndyCar pole position courtesy of a strong run in Saturday’s qualifying session, where he initially progressed from the opening group stages and later threw in the second-fastest lap of the weekend thus far in the Top 12 segment. Rosenqvist’s time would have been enough to see him through to the concluding Firestone Fast Six shootout, but – in pursuit of yet another improvement – the Swede misjudged a braking zone on his following lap, crashing his Chip Ganassi Racing machine into the barriers and bringing out the red flags. With IndyCar rules stripping drivers of their fastest two laps if causing a qualifying stoppage, Rosenqvist was forced to see his Fast Six-sufficient time deleted, instead dropping him to 12th on the grid – a less-than-ideal position at any track, and even less so within the tight confines of a street course. In the race on Sunday, Rosenqvist then found himself stuck in traffic, notably as he came up to lap fellow countryman Marcus Ericsson during a critical pit stop phase. After 85 largely undramatic laps, Rosenqvist eventually came home in tenth place, as the top rookie. “It was quite a static race,” Rosenqvist continues. “We were searching for opportunities to improve, but it never really happened. I think our race was lost after the first pit stop, when we needed some clear air but got stuck behind Ericsson. In IndyCar, you’re racing even if you’re a lap down and that was probably his instructions, but we lost a lot of lap time behind him. With that, we lost (James) Hinchcliffe as well. Victory at Long Beach went to Alexander Rossi, the Californian winning his home race for the second year in a row. The next round of the NTT IndyCar Series takes place at the road course version of Indianapolis Motor Speedway on May 11; a precursor event to the blue-riband Indy 500. 1: Josef Newgarden (USA, Penske), 166 p.
2: Alexander Rossi (USA, Andretti), 138 p.
3: Scott Dixon (NZL, Ganassi), 133 p.
4: Takuma Sato (JPN, RLL), 116 p.
5: Ryan Hunter-Reay (USA, Andretti), 96 p.
12: Felix Rosenqvist (SWE, Ganassi), 80 p.